Have you ever seen one of those sites,.. talking about an MP3-player in your car or as a part of your standard stereo set at home? Or an LCD display in you PC that indicates temperature and CPU load? Well, I have, and I definitly wanted to make one myself. This first main point is that this is just an experiment, so costs should be at a minimum. I started working on an LCD-panel-display, ... 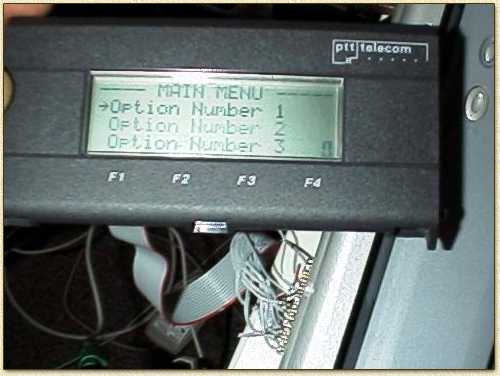 I found a broken desktopmodel phone (model Ericsson DBC661) with a very nice 20x4 display based on a Hitachi 44780 controller. Thanks to these people !! I also have to specially thank Seiko Instruments Germany for their excellent help and support !! Interfacing this display proved to be easy in DOS, however interaction between display-software and MP3-player was simply to hard... so a friend of mine (Saber Karmous) suggested using Linux. I have experience with Linux from my university-days, so I decided to give it a try. At first I tested the device-drive of Nils Faerber and Michael Engel, which did not work for the way I interfaced the CPU and the LCD. So I decided (with some help of Randy Rasa's DOS C-code) the rewrite the device driver, which worked pretty well to. Note: in the meanwhile a lot of tools support controlling an LCD panel in your PC, like WinAmp and MBM Monitor. After wiring the LCD to the parallelport I used Randy's program to test the display in DOS,.. In the LCDLinux.zip you'll find "lcd.tar" with Linux sources. The application-source "lcdtest.c" demonstrates how one can use the display without an device driver. Checkout the README for more software info.